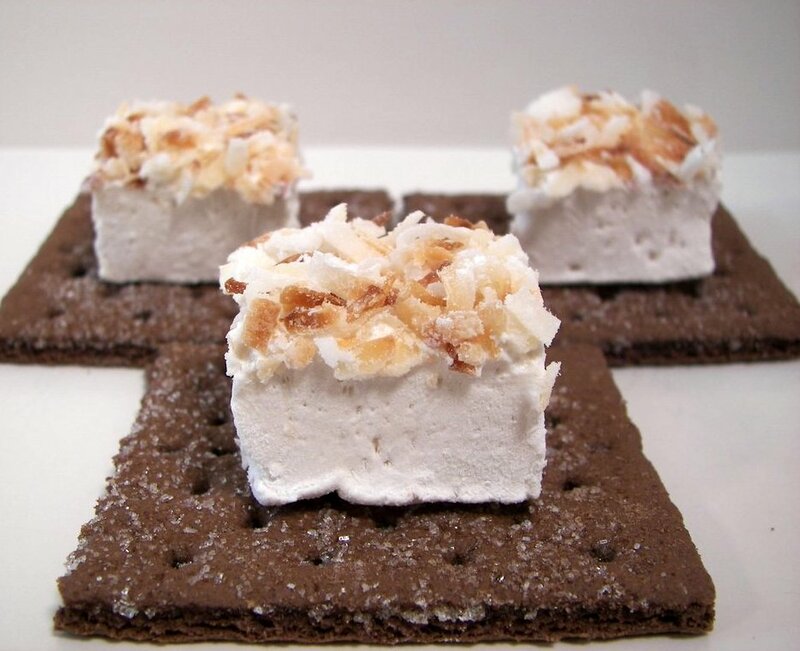 Arrange whole graham crackers in the bottom of an 8x8" square baking dish. In a medium mixing bowl, beat together graham cracker crumbs, butter, sugar, peanut butter, vanilla and salt until smooth. Scoop this mixture into the baking dish and gently spread over the graham crackers. Cover and place in the refrigerator for at least 1 hour. Cut into squares and drizzle with enough melted dark chocolate to make you happy! In a large pot of boiling salted, add spaghetti and edamame - cook about 8-10 minutes. Drain. In a small bowl, whisk together scallions, oyster sauce, vinegar, soy sauce, sugar, sesame oil and crushed red pepper. In a large skillet, heat oil over high. Add carrots - cook about 3-4 minutes, just until the carrots get slightly tender. 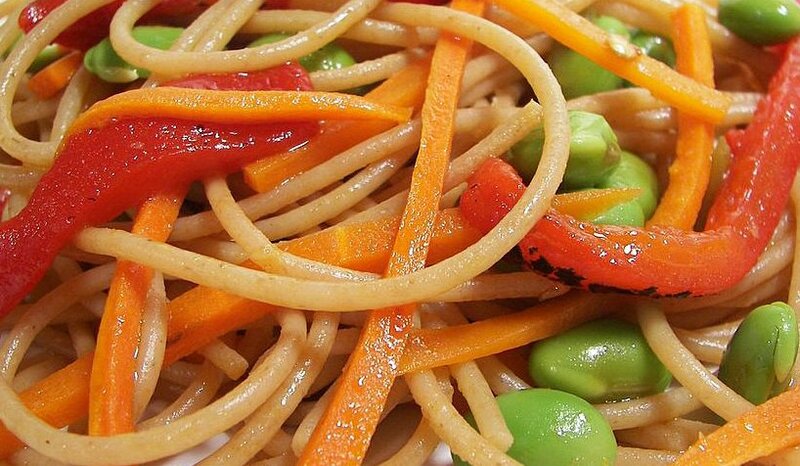 Stir in the cooked pasta, edamame and roasted peppers. Continue to cook until the pasta is crispy in spots, 2 to 4 minutes. Mix in the sauce and toss to combine. 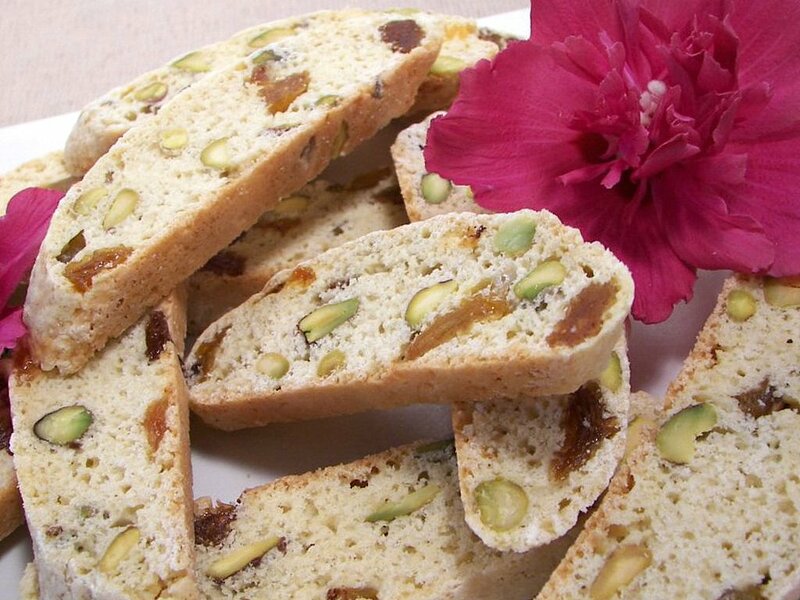 In a large bowl, whisk together flours, sugar, pistachios, raisins, baking powder and salt. In a small bowl, whisk together eggs and vanilla. Add egg mixture into the flour and mix until incorporated. The dough will seem a little dry, so use your hands if necessary to finishing mixing everything together. 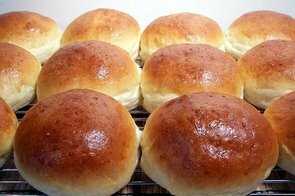 Divide dough in half and roll each into a 12" roll. Move to a baking sheet lined with parchment paper. Gently flatten the logs to just under 1" thick. Bake 18 to 25 minutes, until pale golden and firm to the touch. Remove baking sheet and place on a wire rack - cool 20-30 minutes. 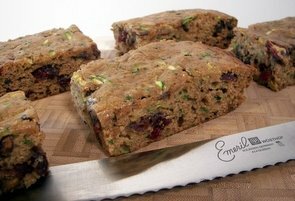 Using a serrated knife, cut each baked loaf into 1/2" thick slices. Place slices, standing up, back onto the baking sheet. Bake about 15 more minutes to dry and firm them up. In a large saucepan, melt butter over medium-high heat until it starts to smell nutty and turns a touch brown. Add rice and cook 1 minute. Add salt and broth - bring to a boil. Cover, reduce heat and simmer about 40 minutes - until the rice is tender. Drain any remaining liquid. In a large bowl, whisk egg and egg white together. Whisk in flour and baking powder. Stir in cooked rice, green onions, almonds, thyme, lemon juice and bacon. Coat a large skillet with cooking spray and place over medium to medium-high heat. Portion out about 3 (or as many as you can fit) 1/4 cup mounds of the rice mixture into the pan. Using a flat spatula, genlty flatten each mound into a circle. Cook until crisp on each side, 2-4 minutes per side. Repeat with the remaining rice mixture. In a large dutch oven, heat oil over medium. Add mustard and cumin seeds. Stir until the seeds begin to pop - 1 to 2 minutes. Remove from heat and transfer to a small bowl. Place pot back over medium and heat remaining oil. Add onion and ginger - cook, stirring often, until the onions begin to soften - about 4-6 minutes. 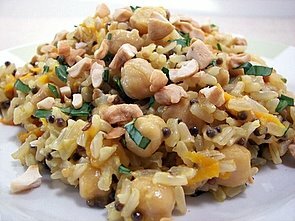 Mix in the popped mustard and cumin seeds, broth, rice, chickpeas, currants and carrot. Firmly cover and bake until the rice is tender and the broth is absorbed, roughly 45-60 minutes. 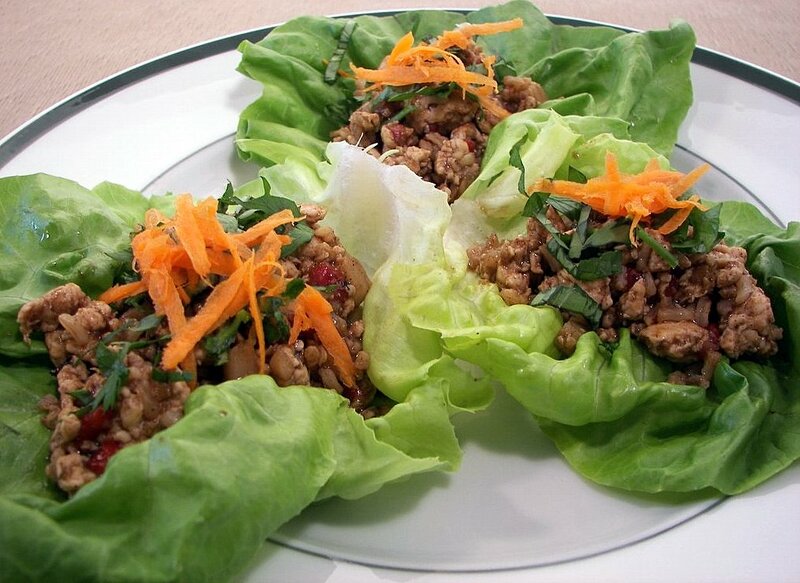 Sprinkle with cilantro and cashews before serving. Click here to be taken to the main post. Puree soymilks, sugar, dry milk, chocolate malted-milk powder and chocolate in a blender until fairly smooth. Place mixture into a large saucepan and bring to a simmer over medium heat, whisking almost constantly. Remove from the heat. In a large bowl, temper the egg whites by slowly whisking in the milk mixture in a slow stream. Whisk in vanilla and salt. For best results, refrigerate this mixture overnight. 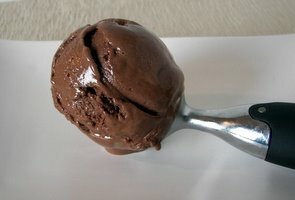 According to your ice cream maker directions, add the chocolate mixture and turn on. Enjoy while still semi soft or place in a bowl and put in the freezer to firm up. 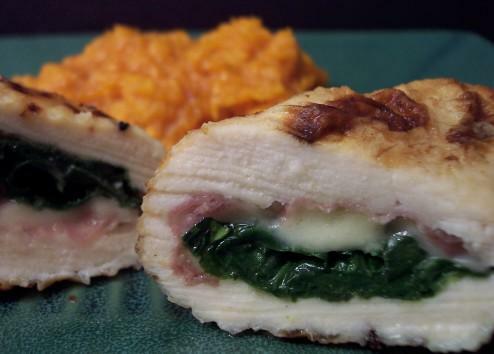 In a glass baking dish, place chicken breast in a single layer. Add in the broth and bake the chicken until cooked through, about 25 to 35 minutes depending on the thickness. Remove and place chicken breats on a cutting board until cool enough to handle. Shred or cut the chicken into cubes. In a medium bowl, whisk together sour cream, mayonnaise, tarragon, salt and pepper. 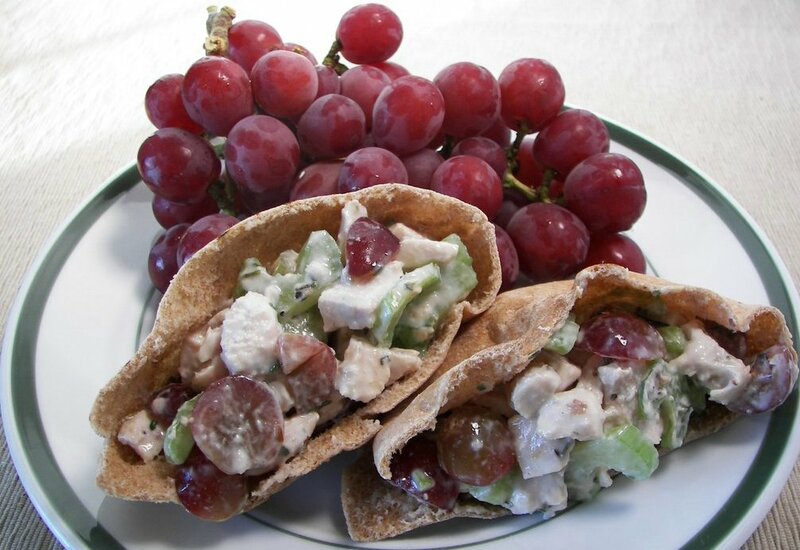 Mix in the celery, grapes, cooked chicken breast and walnuts. Refrigerate at least 1 hour to help the flavor develop. Divide between 4 pitas to serve. Place nuts on a baking sheet and place in the oven to toast for about 4-8 minutes - just until they turn a light golden. Remove and let cool. In a large bowl, mix together almonds, pecans, sunflower seed kernels, rolled oats, soy flour, dry milk, wheat germ, dried apples, raisins and salt. In a saucepan, mix together brown rice syrup, maple syrup, peanut butter and oil. Heat over medium-low, stirring frequently, until well combined. Remove from heat and stir in vanilla. Quickly pour the warm mixture into the dry ingredients and mix with a wooden spoon until well combined. Scoop mixture into a 9x13" pan coated with nonstick spray. Lightly coat fingers with nonstick spray, or water, and firmly pat the mixture into an even layer. Bake about 20-25 minutes, turning around halfway through, until the edges turn a rich golden brown. Remove from the oven and place on a wire rack to cool for 10 minutes. 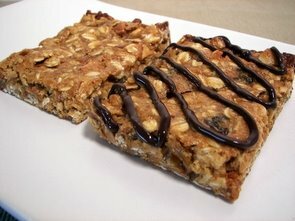 Cut into bars and continue to cool until you can easily handle them. Move to a wire rack and cool competely. Place white cheddar, Parmesan, ricotta and salt in a food processor. Process until thick and creamy - about 1 minute. Scrape down the sides and process another 30 seconds. Scoop into a small bowl. Bring a large pot of water to a boil and season with salt - 2-3 teaspoons. Add pasta and cook about 7 minutes, or until tender. Drain. In the same pot you cooked the pasta, melt 1 tablespoon butter. Whisk in flour and mustard until smooth. Slowly pour in the milk, Frank's Red Hot and nutmeg while whisking constantly. Bring back to a boil, reduce heat and simmer until it starts to thicken - about 4 minutes. Be sure to stir this mixture often. Remove pan from heat and drop in dollops of the cheese mixture. Whisk until melted and smooth. Stir in pasta and place back over medium-low heat. While stirring constantly, warm the mixture for 3-4 minutes. Scoop mixture into an 8x8" baking dish coated with nonstick spray. In a small bowl, melt the remaining 1 tablespoon butter. Add in panko and stir until moistened. 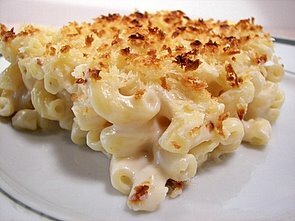 Sprinkle panko mixture over macaroni and cheese. Place in the oven and broil until golden - 1-3 minutes. Remove and let sit for 5 minutes before serving. Add the flour mixture along with the grated zucchini into the butter mixture. Stir just until combined and then gently fold in the dried canberries and pecans . In a large bowl, whisk together flours, cornmeal, baking soda and salt. In a medium bowl, whisk together yogurt, maple syrup, honey, oil, vanilla and orange zest. Pour mixture into the dry ingredients and stir just until combined. 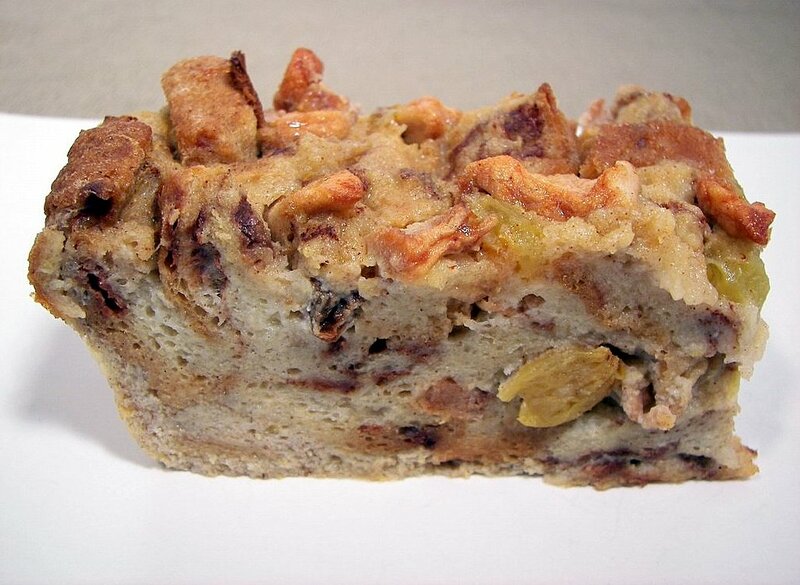 Genlty fold in chopped dried fruit and sunflower seeds. Evenly divde batter between 4 mini loaf pans lightly coated with nonstick spray. Bake for 30-40 minutes, rotating halfway through, until a toothpick placed in center comes out with a few moist crumbs attached. Carefully remove from the pans and place on a wire rack to cool completely. In a large skillet, heat oil over medium-high. Add chicken and garlic - cook for about 4 minutes. 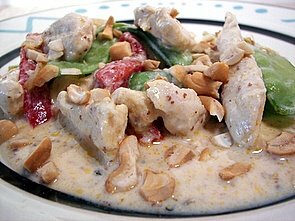 Add cashews, bell pepper and snow peas - cook until tender, about 2 minutes. Add chicken broth, reduce heat and simmer for 8-10 minutes or until chicken is cooked through. Move chicken and vegetables (keep any liquid in the pan) to a bowl and keep warm. Whisk in sour cream, Dijon and honey to the juices in the skillet and heat until warmed through. Pour sauce over chicken mixture and toss to combine. In a small bowl, add boiling water and raisins - let sit for 15 minutes, drain. In a Dutch oven over medium-high heat, add spinach and 2 tablespoons water. 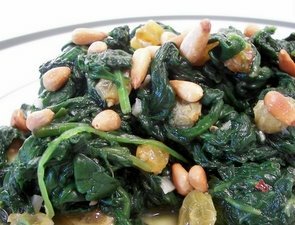 Cook until spinach wilts, making sure to stir often. Remove spinach mixture and wipe any remaining water in the pan out with a paper towel. Place pan back on stove and heat oil over medium. Add garlic and cook 30 seconds. Mix in spinach, raisins, salt, and pepper. Cook until thoroughly heated, about 1 minute. Serve with pine nuts sprinkled on top. 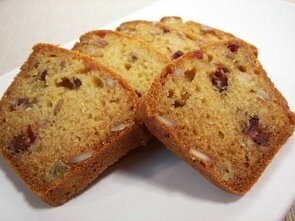 Microwave raisins, dried apple, and Calvados on high for 1 minute - cool completely. In a large bowl, whisk together soymilk, sugar, lemon zest, butter, salt, cinnamon, nutmeg and eggs. Genlty mix in cubed bread and raisin mixture. Let sit 15 minutes to allow the bread to absorb the liquid. Pour into an 8" baking dish lightly coated with nonstick spray. Bake until set in the center, about 50-60 minutes - be sure to turn around halfway through. Heat a large skillet with 1 teaspoon olive oil over medium-high. 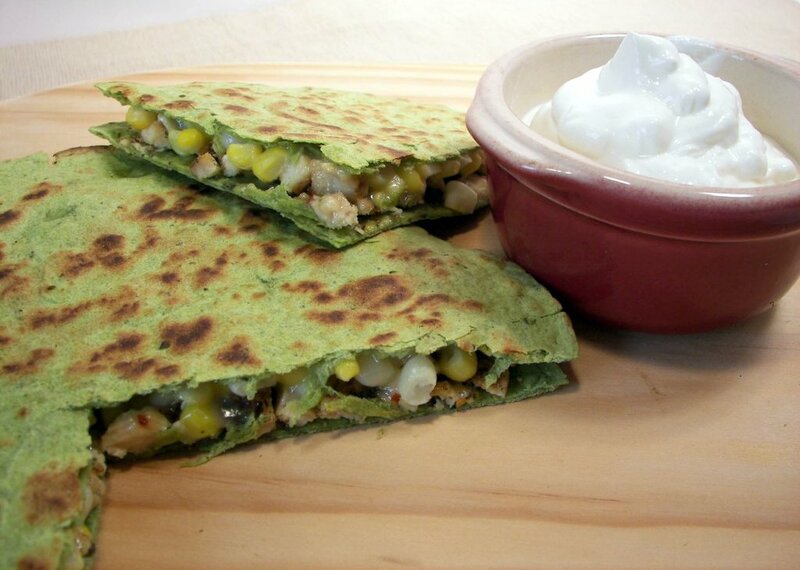 Place one tortilla down and scatter half of the chicken, corn and jalapenos on top. Quicky place 2 ounces of shredded cheese evenly on top and then add another tortilla. When the bottom is crisp and golden, carefully flip the tortilla to brown the other side. Repeat with remaining oil, tortillas, chicken, corn, jalapenos and cheese. In a medium saucepan, mix water and broth - bring to a boil. 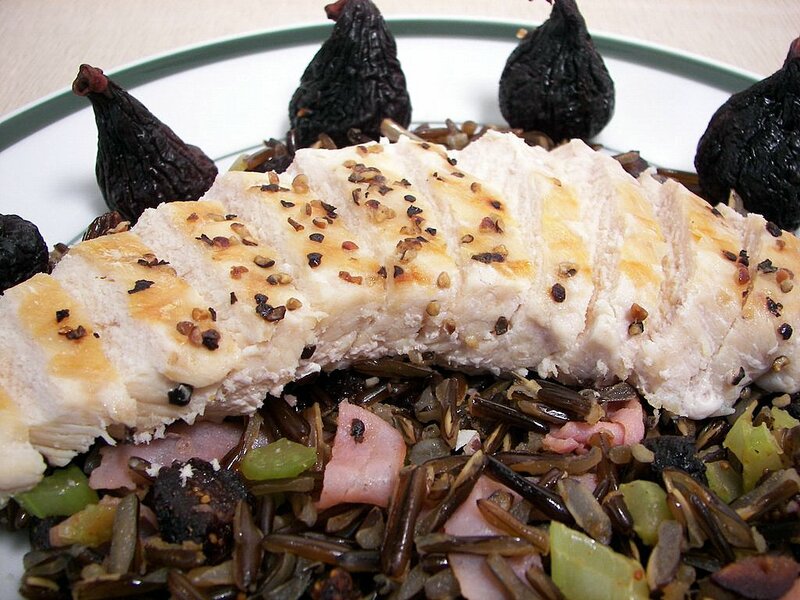 Stir in wild rice - cover, reduce heat and simmer until rice is tender. This might take about 45 - 60 minutes. Drain any leftover liquid. In a large skillet, melt butter over medium-high heat. 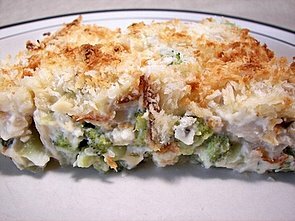 Stir in onion and celery - cook until tender, about 5 minutes. Mix in cooked rice, figs, prosciutto, thyme, 1/4 teaspoon salt, 1/4 teaspoon black pepper and paprika. Remove from heat and cover to keep warm. Season the chicken breasts with the remaining salt and pepper. 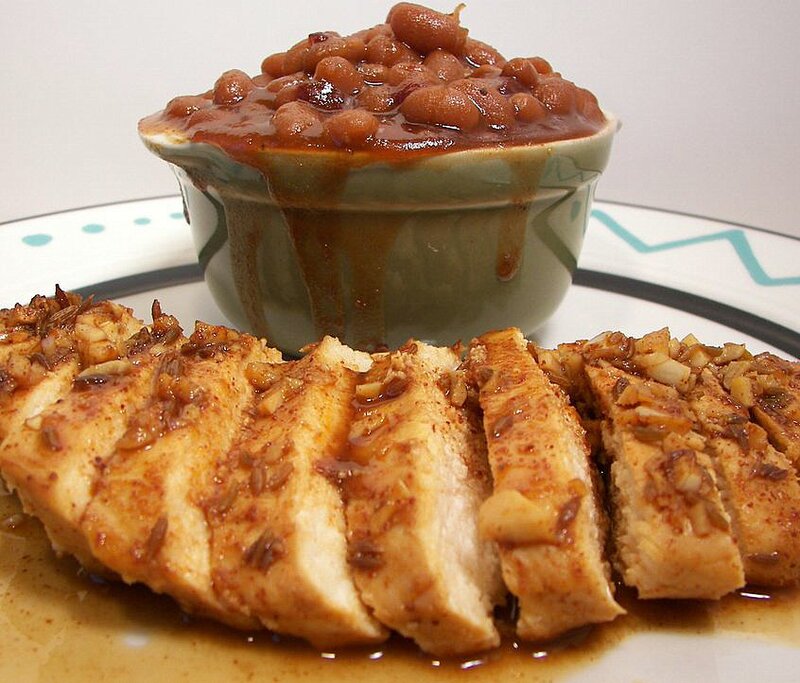 Grill chicken breasts until thoroughly cooked. 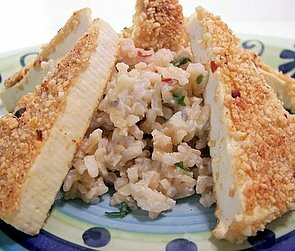 Portion out the rice pilaf and serve each with a chicken breast. Cook rice according to the package directions. 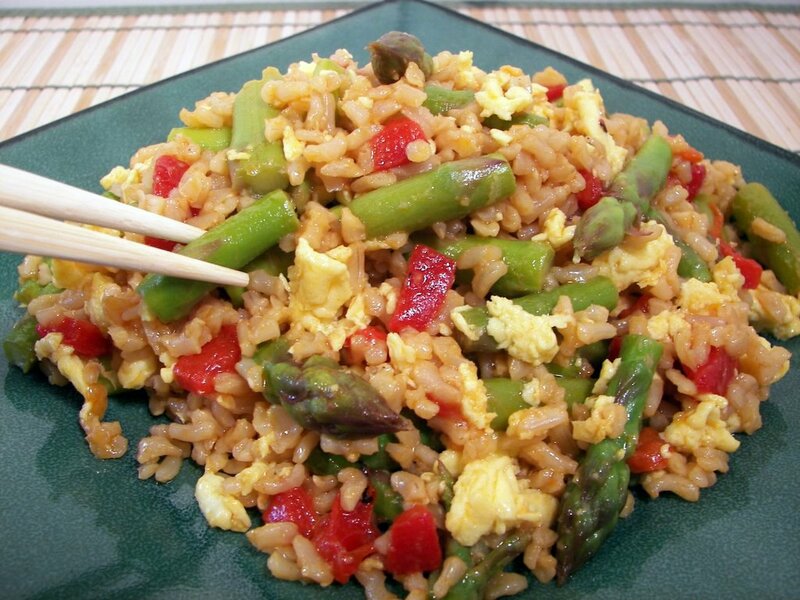 Using brown rice will take 40-50 minutes, so start the rice ahead of time. Mix in cilantro. In a large skillet, heat oil over medium-high heat. Stir in onion and 1/2 teaspoon salt. Cook until onion is tender, about 2-4 minutes. Mix in tamarind, making sure to break it up and cook for 2 more minutes. Add ginger, garlic, coriander, turmeric, red pepper and cinnamon. Continue cooking for 2 minutes, making sure to stir frequently. Add remaining 1/2 teaspoon salt, sweet potatoes, water, milk, and tempeh. Bring to a boil, cover, reduce heat and let simmer for 15 minutes or until the potatoes are tender. Take off the cover, then stir in juice and soy sauce. Simmer until slightly thickened, 3 to 5 minutes. Remove and discard cinnamon stick. Serve the curry with the cooked rice. In a large bowl, whisk together flour, cornmeal, sugar, baking powder, salt, cumin and baking soda. In a medium bowl, whisk toether buttermilk, butter, chiles, and egg. Add wet mixture into flour mixture and stir just until combined. Gently fold in bacon. Scoop batter into an 8" baking dish coated with nonstick spray. Bake 18 minutes or until a toothpick inserted in center comes out with a few moist crumbs attached. Cool 10 minutes in pan on a wire rack before cutting. In a medium saucepan, add butter and cocoa powder - melt slowly (be sure to stir frequently) over low heat. When smooth, set aside and cool slightly. In a medium bowl, whisk together sugar and espresso powder. Whisk into the melted butter and cocoa. Whisk in eggs and vanilla. In a medium bowl, whisk together flour, cinnamon, nutmeg and salt. Stir into the wet mixture just until combined. 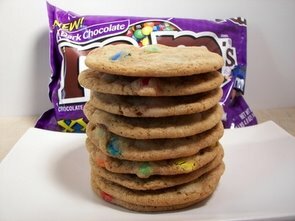 If desired, fold in M&Ms or chocolate chips - I opted to place them on top but you can mix them in. 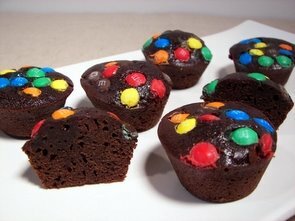 Portion out into 36 mini muffin cups lightly coated with nonstick spray. Bake for 8-12 minutes - when you test for doneness with a toothpick, you want it to be still a little wet in the center of each cup. Remove and let cool completely in the pan. In a medium bowl, whisk together lime juice, soy sauce, oil, chili powder, cumin seeds, coriander, garlic and honey. Pour mixture into an 8" baking dish and place the chicken breasts in. Cover and refrigerate for one hour. Uncover and pour in the white wine. Place in the oven and broil for about 8 to 10 minutes, basting it with the juices to keep it moist. Remove and let cool about 5 minutes. Move chicken to a cutting board and slice. Serve with a drizzle of the pan juices. Lightly coat an 11x7" baking dish with cooking spray. Place the thawed broccoli on the bottom in an even layer. In a large saucepan, whisk together soymilk, flour, salt, and pepper. Bring to a boil over medium-high. Cook until thick, about 1 minute. Remove from heat and stir in cheddar and cream cheese. 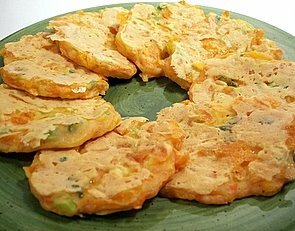 Mix in sour cream, yogurt, onion, and water chestnuts. Spoon mixture evenly over the broccoli. In a small bowl, toss together panko and melted butter. 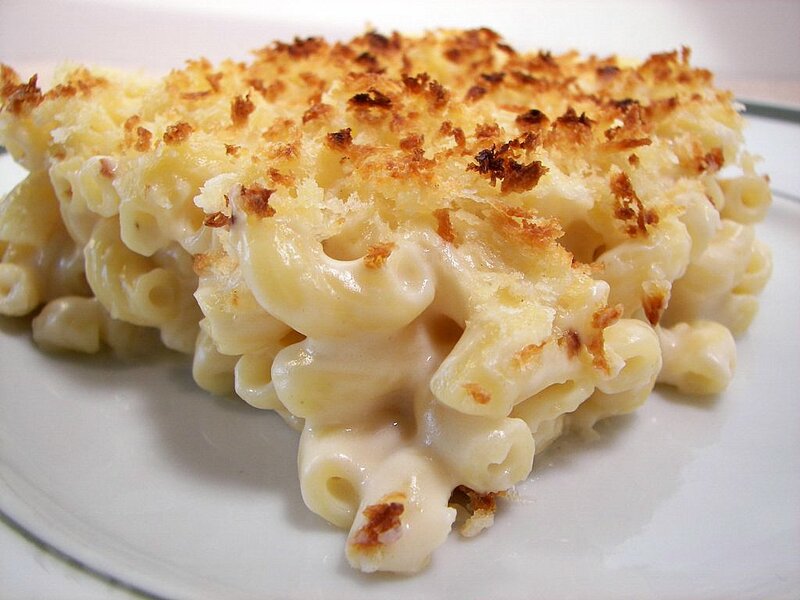 Scatter breadcrumbs over the cheese mixture. Bake 25 minutes or until golden and bubbly. In a small saucepan, melt butter over medium-high. Stir in flour with a whisk and cook for about 2 minutes. Mix in the thyme. Slowly mix in the soymilk, whisking constantly, and continue cooking until it starts to thicken - about 3 minutes. Stir in the Gorgonzola. Stir until the cheese completely melts in. Season with salt and pepper, remove from heat. In a 13x9" baking dish lightly coated with nonstick spray, line the bottom with 1/4 of the sliced potatoes. Pour about 3/4 cup sauce over potatoes. Repeat layers twice. 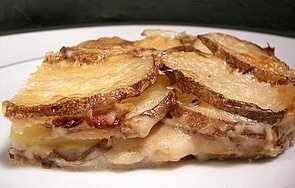 Place the remaining potato slices on top. Scatter grated Parmigiano-Reggiano on top. Cover and bake for 30 minutes. Uncover and continue baking for 40 minutes or until potatoes are tender. Remove and let sit 10 minutes before serving. To do these in batches, preheat the oven to 200 and set a baking sheet lined with parchment inside to keep them warm. In a medium bowl, whisk together flour, cornmeal, mustard, salt and baking powder. Add carrots, green onions, cheese, egg and milk - mix until thoroughly combined. Heat 1/2 tablespoon oil in a large skillet over medium. Fill the skillet with tablespoonfuls of the batter and gently spread each into a 3" circle. Cook until golden on each side, about 2-3 minutes per. Move them to the baking sheet in the oven to keep warm. Heat the remaining oil and repeat with remaining batter. In a large skillet, add 1 teaspoon olive oil and heat over medium-high. Add shallots and cook until they begin to turn a light brown. Add cumin and garlic - cook for an additional minute. Stir in tomato puree and canola oil. Cook for 2 minutes or until thick - mix in honey, vinegar, molasses, Worcestershire, salt and chiles. Reduce heat and simmer for about 10 minutes - be sure to stir often. In a 2 quart baking dish, mix together beans and the above mixture. Bake until thick and bubbly, about 60-70 minutes. 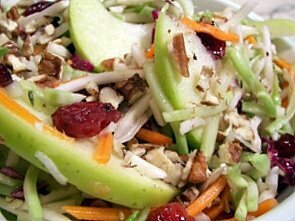 In a large bowl, toss together broccoli slaw and cranberries. In a small bowl, whisk together rice vinegar, sugar, white wine vinegar, olive oil, salt and pepper. 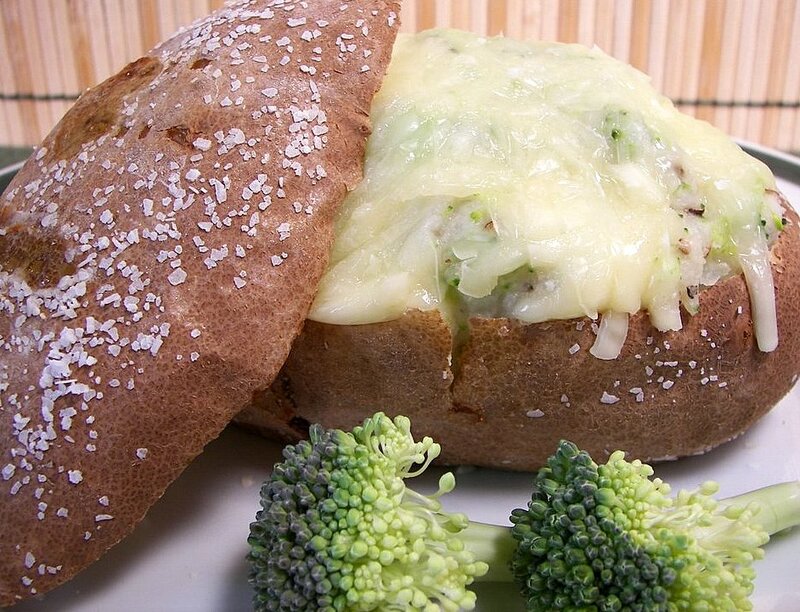 Drizzle over broccoli mixture and toss gently to coat. Cover and chill 2 hours. Mix in apple slices. Scatter the top with the toasted pecans. In a large saucepan, heat oil over medium. Add onion, and cook 10 minutes, stirring often, until they cook down and are golden. Stir in water, broth, potatoes and garlic. Bring to a boil, cover, reduce heat and simmer 20 minutes or until the potatoes are very tender. Using an immersion blender, puree until most of the big chunks of potatoes are blended, but leave some medium sized bits behind. If you don't have a stick blender, process them in 1 cup batches in a blender. Return soup to the pot if you used a blender, season with salt and pepper and simmer a couple of minutes until fully heated through. In a heavy skillet, place oil and carrots inside and heat over high. Cook, stirring often, until the carrots brown - about 10 minutes. Mix in garlic, tomatoes, mint, lemon slices, sugar, salt, anise and cumin. Continue cooking until very bubbly. Reduce heat to low, cover and cook for 20 minutes. Stir the carrots once again to turn them all around. Cover again and cook until the carrots are very soft, about 20 minutes more. Add the saved lemon juice and season with fresh ground pepper to taste. Serve warm or cold. In a small saucepan, add water and bring to a boil. Add rice, reduce heat, cover and simmer for 5 minutes. Remove from heat and keep warm. In a large skillet, heat oil over medium-high. Add turkey and ginger. Cook for about 4-6 minutes, until the turkey is done, crumbling the meat with a wooden spoon. Mix in the cooked rice, bell pepper, broth, water chestnuts, hoisin, five-spice powder and salt. Continue to cook for about 1-2 minutes, or until thoroughly heated. Divide mixture between lettuce leaves, scatter with fresh herbs and the shredded carrot. Roll into wraps. Using a sharp knife, cut tofu into 9 rectangles. Cut each one in half at a diagonal to make two triangles. Place tofu onto 3 or 4 layers of paper towels and cover with another 3-4. Set a heavy cutting board or heavy pan on top to draw out more of the liquid from the tofu for about 20 minutes. In a medium saucepan, mix together dry rice and soymilk. Bring to a boil, cover and reduce heat - simmer for 5 minutes. Mix in green onions, cilantro, bell pepper, and 1/2 teaspoon salt. Cover and keep warm. Place peanuts in a food processor and pulse until finely ground. In a shallow dish, mix together ground peanuts, garlic, ginger, red pepper and remaining 1/2 teaspoon salt. In another shallow dish, mix together water and egg white. Dip one side of each tofu piece into the egg mixture. Place the same side into the peanut mixture and lightly press to adhear - move to a cutting board. In a large skillet, heat oil over medium heat. Add tofu pieces and cook until golden on each side - about 2-4 minutes. If your pan will not hold all of the tofu, do this in two batches using 1 1/2 teaspoons peanut oil for each. Serve the crisp triangles with the brown rice. In a medium saucepan, add water, rice and salt. Bring to a boil. Reduce heat, cover and simmer for 30-40 minutes or until most of the liquid is absorbed. Mix in evaporated milk, honey and cardamom. Bring back to just boiling, reduce heat to a simmer and cook uncovered about 5 minutes until thick and creamy - make sure to stir often. 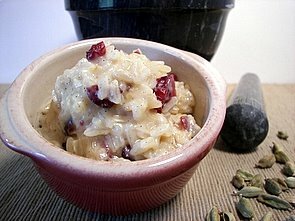 Stir cranberries into the warm pudding right before serving. In a small bowl, thoroughly mix together black pepper, rosemary, salt, garlic and one teaspoon olive oil. Rub all over the pork tenderloin and let sit for 15 minutes. In a large skillet (oven safe), heat the remaining 2 teaspoons oil over medium high. 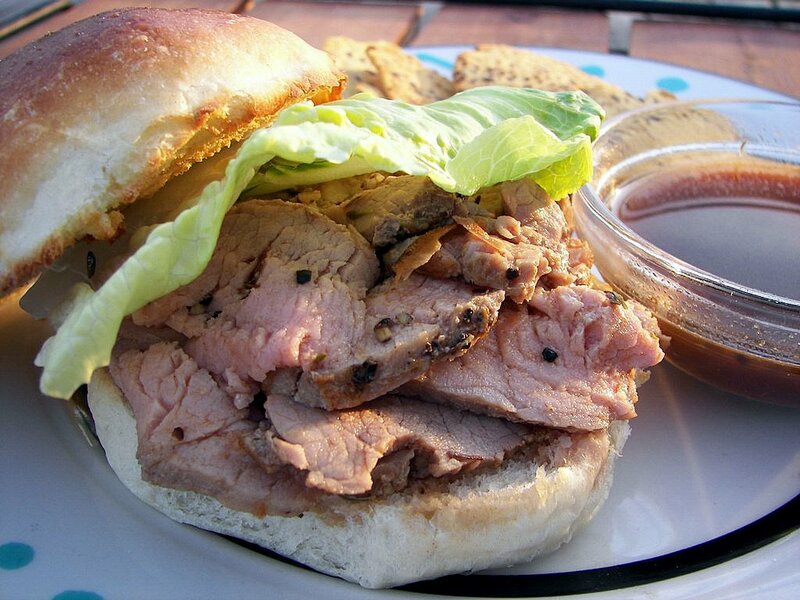 Add pork and brown on all sides. Place in the oven and bake for roughly 10 minutes - for medium, take the tenderlion out when a thermometer registers around 145. Cover and let sit for about 10 minutes. Thinly slice pork. Place skillet back over medium-high heat and add broth. Scrape the bottom with a wooden spoon to release any browned bits. Whisk in sherry and tomato paste. Bring to a boil, reduce heat and simmer 5 minutes. Serve in crusty rolls, split in half, with small bowls of the jus to dip. In a medium bowl, mix together tomato, beans and corn. On a pizza peel or large baking sheet, scatter cornmeal on top. Stretch the dough into a rough 12" circle and lay it on top of the cornmeal. Bake on a pizza stone, or on the baking sheet, for 4 to 5 minutes. You want it to be a little puffy and lightly golden on the bottom. Carefully remove the crust. 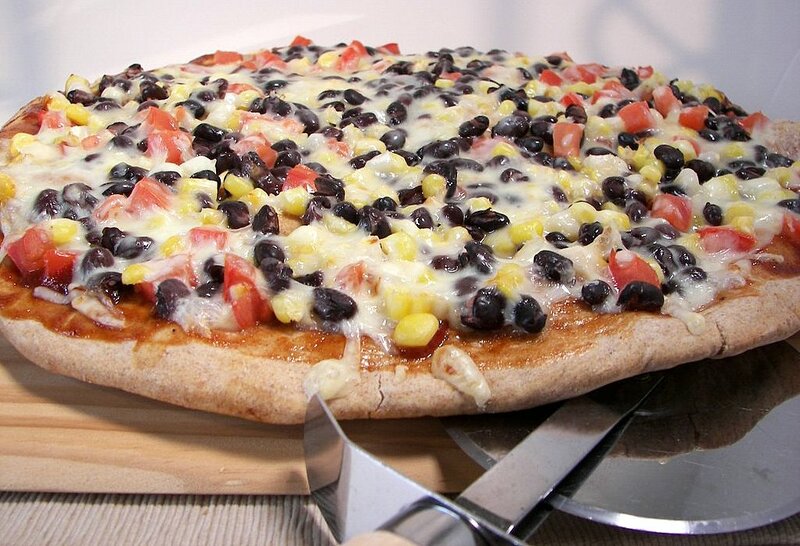 Spread barbecue sauce on and scatter with the tomato mixture and cheese. Place back in the oven and cook until the cheese melts and the bottom of the crust is browned - about another 4-5 minutes. In a small saucepan, melt butter over medium-low until it smells very nutty and gets a light golden color. Let cool slightly. In a large mixing bowl, cream together melted butter and sugars. Beat in vanilla, egg and egg yolk until the color lightens and is thoroughly mixed. In a medium bowl, whisk together flour, baking soda and salt. Pour dry mixture into the wet and use a large wooden spoon to stir together just until combined. Fold in the M&Ms. Cover and place in the refrigerator for at least 2-3 hours. Scoop out dough using a 1/4 cup measure and place on parchment lined baking sheets. These spread a little so I only placed 6 per baking sheet. Bake for 15-18 minutes, turning the baking sheet halfway through. The edges should be slightly golden with the center being puffy and a little undercooked. Remove and let cool on the baking sheets for about 5 minutes. Carefully place each cookie on a wire rack to cool completely. In a Dutch oven, heat oil over medium-high. Add Ras el Hanout and toast for 30 seconds. Stir in beef and cook about 3 minutes. Mix in onions, water, salt, and broth. Cover and and place in the oven to bake for 1 hour. Carefully remove from the oven and stir in dried plums and honey. Place back in the oven to cook for 15 more minutes. 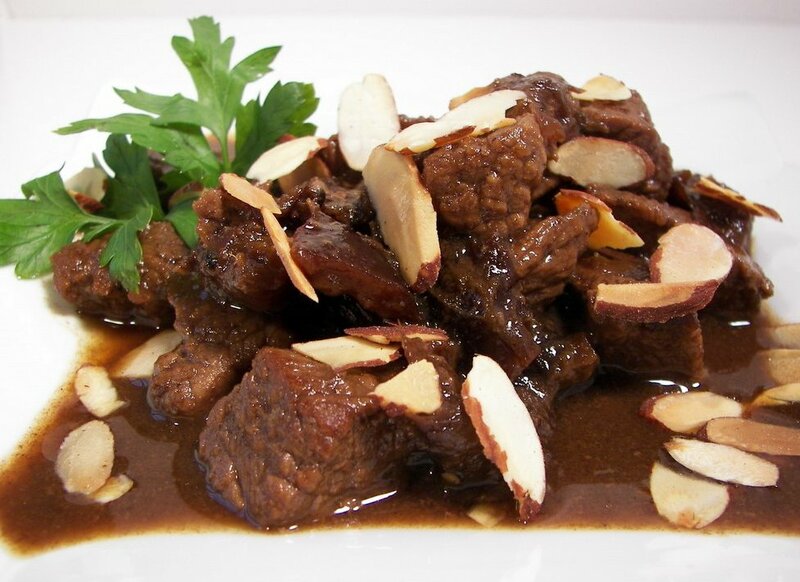 Remove and sprinkle with almonds before serving. In a small bowl, whisk together all ingredients - this makes more than you need, but you can use it as a seasoning for other cuts of beef or on salmon. 1 tablespoon minced chipotle chile (canned in adobo) plus 1/2 teaspoon adobo sauce. In a small bowl, whisk together cilantro, sour cream, chipotle chile, adobo sauce, cumin, chili powder, lime juice and salt. In a small skillet, melt butter over medium heat. Add corn kernels and cook 3-4 minutes until heated through and tender. Remove from heat and let cool. 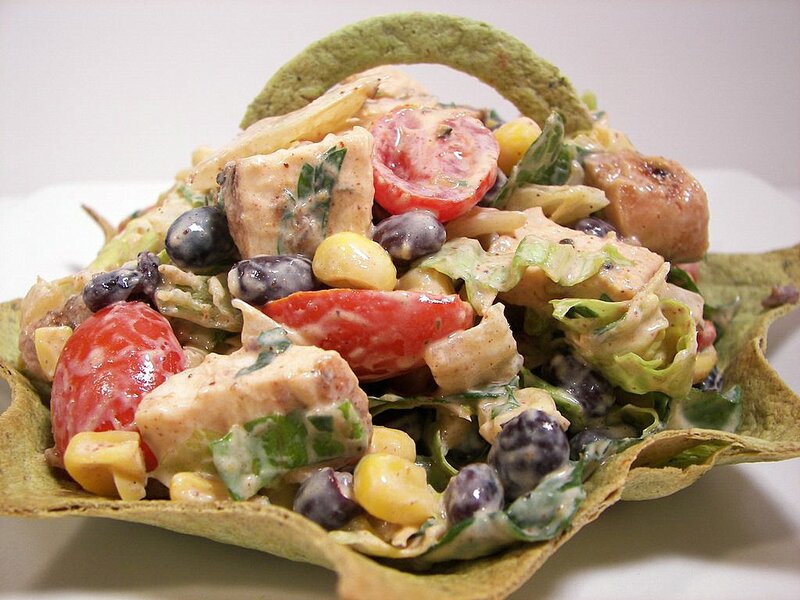 In a large bowl, add lettuce, chopped chicken, tomatoes, avocado, onion, black beans and sauteed corn. Gently toss together. Add dressing and toss to thoroughly combine mixture. In a medium bowl, whisk together flour, granulated sugar and 1/8 teaspoon salt. In a large mixing bowl, add cream cheese, butter and milk. Beat until creamy and well combined. Mix in the flour mixture and beat just until combined. Scoop dough out onto a lightly floured surface and gently knead a couple times until it comes together. 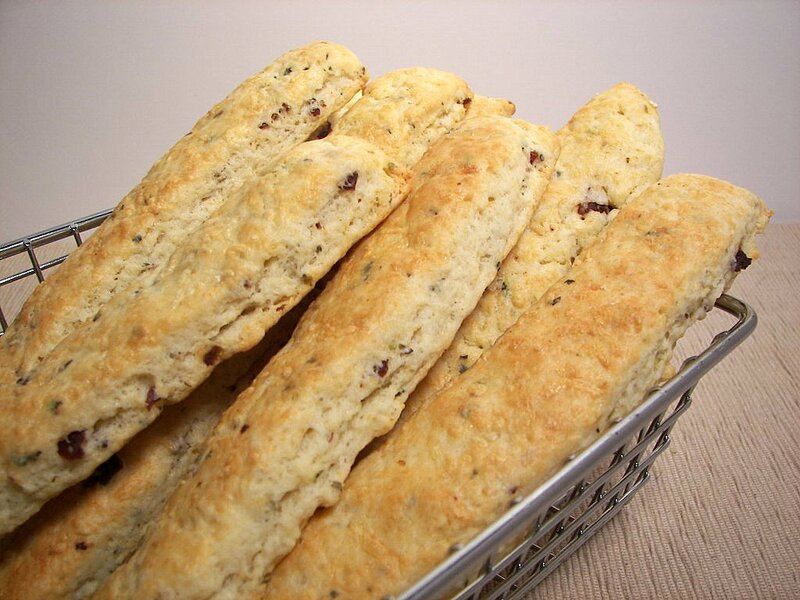 Evenly divide dough into 24 pieces. Lightly coat 24 mini muffin cups with nonstick spray. Press one dough piece into the bottom and up sides of the muffin cup. Spoon about 1/2 teaspoon walnuts in each cup. In a medium bowl, whisk together brown sugar, brown rice syrup, zest, juice, salt and egg. 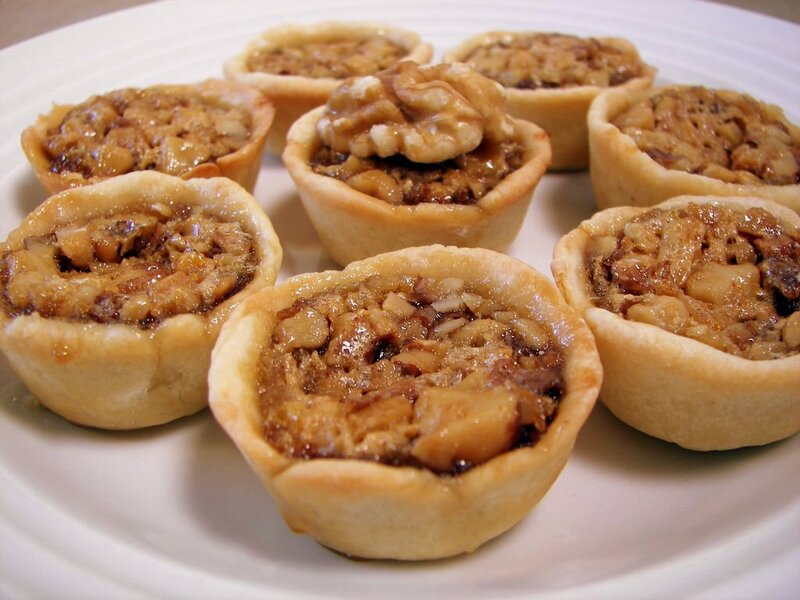 Pour about 2 teaspoons over walnuts in each muffin cup. 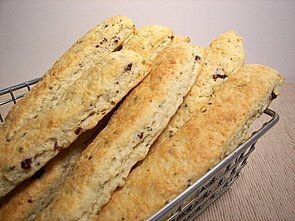 Bake until the crusts are lightly browned and the filling is very puffy - about 18-22 minutes. Remove and place on a wire rack to cool for 10 minutes. Carefully remove each tassie, running a knife around the sides if necessary, and place on a wire rack to cool completely. In a medium bowl, whisk together vinegar, oil, sugar, lemon juice, mustard, basil, salt and pepper until well blended. In a medium saucepan, bring water to a boil and add salt. 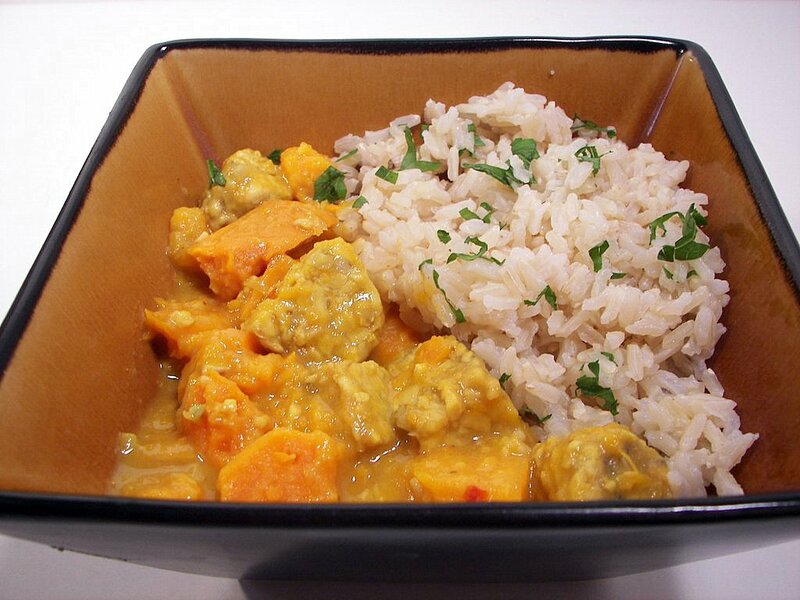 Mix in the rice blend, reduce heat, cover and simmer for 35-40 minutes or until tender. Drain any remaining liquid. In a medium bowl, toss together apples and lemon juice. Heat a nonstick skillet over medium-high heat. Add apple mixture and cook 3-6 minutes or until crisp tender. In a large bowl, gently toss together cooked rice, spinach, chicken, grapes, and cheese. Pour in the dressing and toss to coat. 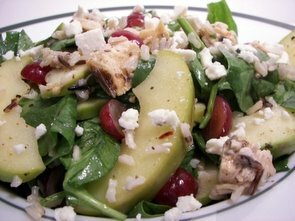 Evenly divide salad between plates and top each with an even amount of the apple wedges. In a large mixing bowl, beat together powdered sugar, butter and vanilla in bowl until combined. Mix in the melted chocolate mixture. Cover and set in the refrigerator until ready to use - be sure this is well chilled before using. In a medium bowl, sift together flour, cocoa, baking soda and salt . In a large mixing bowl, mix together butter and shortening until smooth. Add in sugars and cream until light and fluffy. Mix in egg, 2 teaspoons water, vanilla and instant coffee until well combined. Beat in the flour mixture until combined. Fold in chocolate chips. Cover and refrigerate at least 2 hours. Scoop out 1/2 tablespoon balls of dough and place onto parchment lined baking sheets - leave enough room for them to expand. Bake about 10-12 minutes, turning halfway though, until the tops are no longer shiny. Let cookies cool on the sheets for 10 minutes. Move cookies to a wire rack and cool completely. 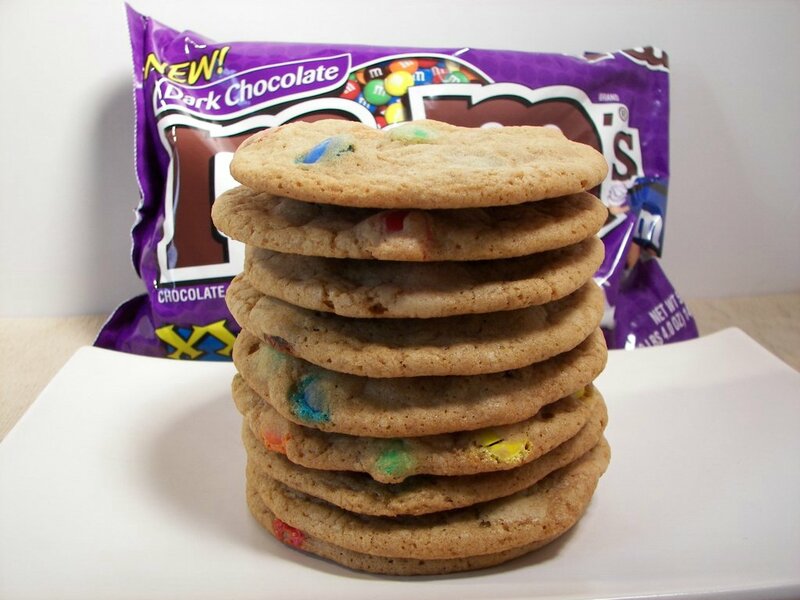 Spread half of the cookies with 1/2 to 1 tablespoon filling. Top each with a second cookie, gently pressing to adhere. 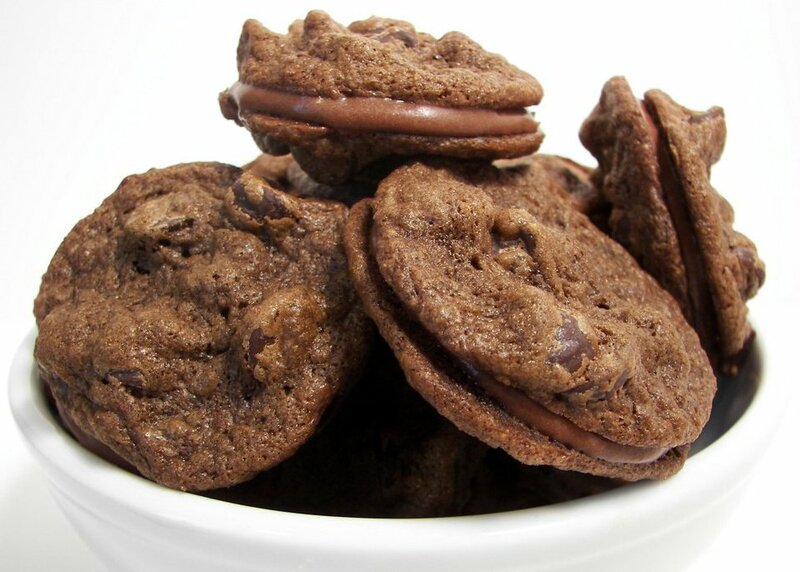 Because of the filling, these cookies need to be kept cold - store in the refrigerator until serving. In a small saucepan, add milk, 1 cup water, sugar, butter and salt. Heat over low just until the butter melts - cool to lukewarm. In a medium bowl, whisk together 3 cups flour with the yeast. Pour the milk mixture into a large mixing bowl. Mix in the flour/yeast mixture, 1 cup at a time, until all 3 cups are in, beating until smooth. Stir in enough of the remaining flour to make stiff dough. Scoop the dough onto a lightly floured surface. Knead until smooth and elastic (about 8-10 minutes), adding enough of the remaining flour to prevent the dough from sticking to your hands. Move dough into a large bowl lightly coated with cooking spray. Cover and let rise until doubled, about 60 minutes. Uncover and punch down the dough. Evenly divide into 12-16 pieces, depending on how large you want the buns to be. Form each piece into a tight ball and place about 2" apart on a parchment lined baking sheet - you may need to use 2 sheets depending on the size. Slightly flatten each ball. Cover and let rise until doubled - another 30 to 45 minutes. In a small bowl, whisk together egg yolk and water. Gently brush egg wash over each bun. Bake about 20-25 minutes, until golden and they sound hollow when tapped on the bottom. Transfer to a wire rack and cool completely. 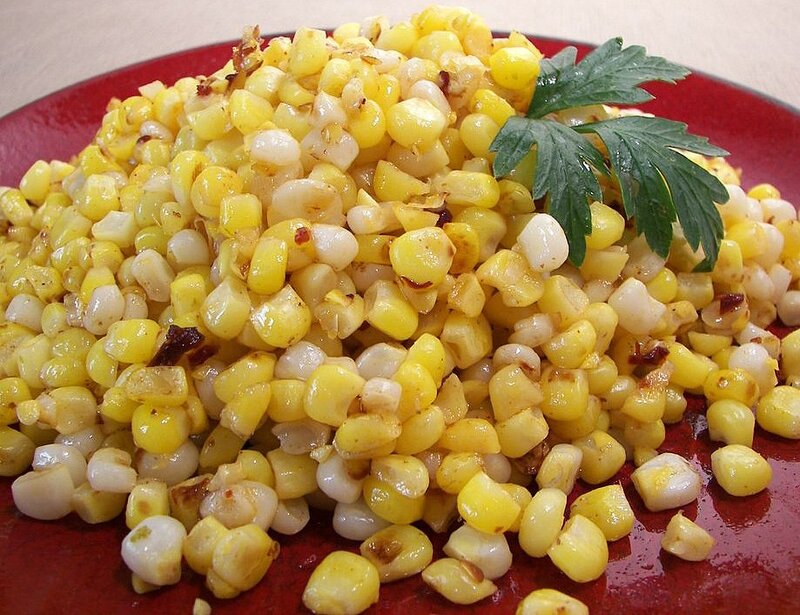 In a small pot, mix together 2 1/2 cups water with 2 cups corn kernels. Bring this mixture to a boil. Lower heat and simmer 5 minutes until tender. Mix in 1/4 teaspoon salt. Carefully pour mixture into a blender and process until smooth. Pour the mixture in a sieve over a medium bowl. Discard, or save the bits of corn left in the sieve for another use. Keep liquid warm. In a medium saucepan, add vegetable broth and bring to a gentle simmer. Reduce head to low to keep warm. In a large skillet or saucepan, melt butter over medium-high. Add rice and cook 1 minute - making sure to stir constantly. 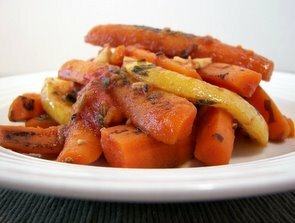 Stir in onions, carrots, and celery - cook 3 minutes. Stir in 1/2 cup of the vegetable broth to the rice until it is fully absorbed, then continue adding using 1/2 cupfuls until it is all used up - this should take about 20 minutes. Add peas, remaining 1 cup corn, fennel, 2 tablespoons cheese and thyme. Stir until well mixed and hot - reduce heat to very low and keep warm. In a small bowl, whisk together vinegar, oil, sugar, salt and garlic. Evenly divide corn broth between 4 bowls. Evenly spoon the risotto between the 4 bowls and then drizzle each with a bit of the vinaigrette. 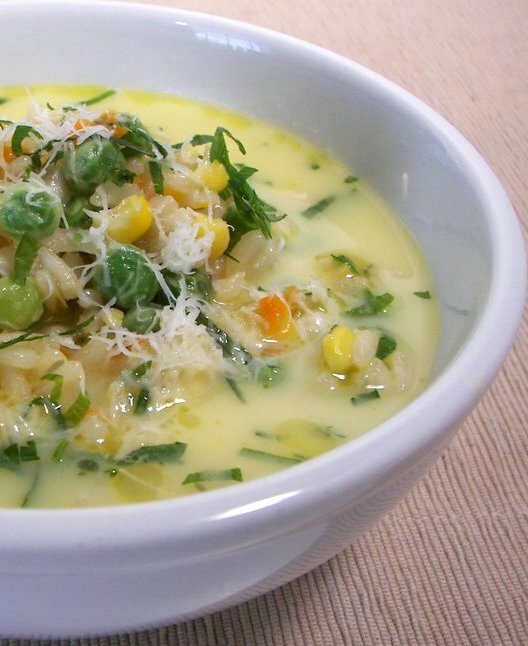 Scatter the remaining cheese, parsley and chives over each bowl. In a large mixing bowl, beat together confectioners' sugar, butter, shortening, peppermint extract, flour and heavy cream until completely combined. To make the slab, cover the back of a 9x13" pan with saran wrap. Lightly coat with nonstick spray. 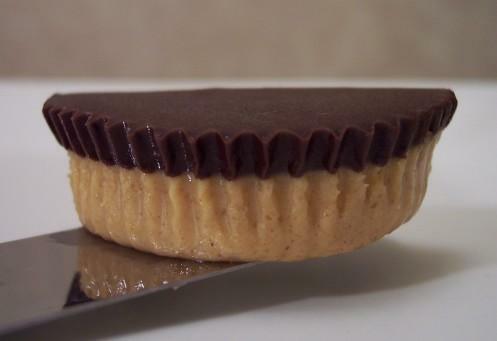 Evenly spread the filling on top of the wrap to form a rectangle just a touch smaller than the bottom. Cover with more saran wrap and refrigerate overnight. In a large saucepan set, melt butter over medium-low heat. Add brown sugar and stir until combined. Leave on stove and heat the mixture until very hot - but don't let it simmer or boil. Keep stirring until it becomes shiny and pretty smooth. Remove from heat and mix in the cocoa, salt, baking powder, and vanilla. Whisk in the eggs, one at a time, until smooth. Combine the flour with the chocolate chips, then add that mixture into the batter. Mix until combined. Lightly coat a 9x13" pan with nonstick spray. Scoop half of the batter into the bottom of the pan. Remove the filling slab from the refrigerator and peel off the saran wrap. Gently place the filling in the pan, on top of the bottom layer, and finish covering with the remaining batter. Bake for roughly 35-45 minutes, until a toothpick placed in the center comes out with a few moist crumbs attached. Remove and place on a wire rack to cool completely. In a large bowl, whisk together ground flaxseeds, flours, baking powder, baking soda, salt and cinnamon. In a medium bowl, whisk together eggs and maple syrup. Add in buttermilk, oil, orange zest, orange juice and vanilla - whisk until blended. Add the wet ingredients into the dry and fold together just until combined. Gently fold in the blueberries. 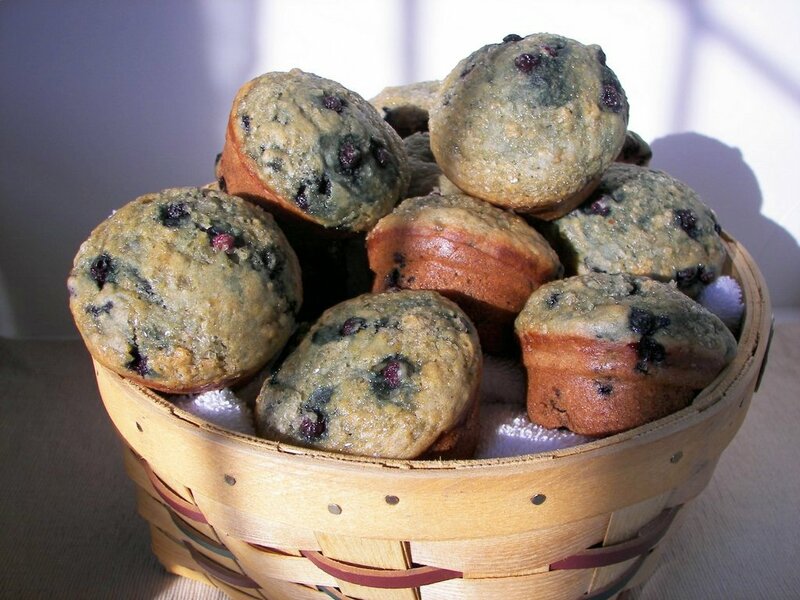 Evenly divide the batter between the wells of a 12 cup muffin tin lightly coated with cooking spray. Sprinkle tops with the raw sugar. Bake for 15 to 25 minutes, until a toothpick comes out with a few moist crumbs attached. Remove from the oven and let cool slightly for 5 minutes. Carefully remove muffins to a wire rack and cool completely. In a large pot of boiling salted water, cook the pasta using the package directions. Drain and toss with 2 teaspoons olive oil. Using the same pot, add 1 teaspoon oil and heat over medium. Add zucchini and cook 7 minutes. Mix in minced garlic and cook about 3 minutes. 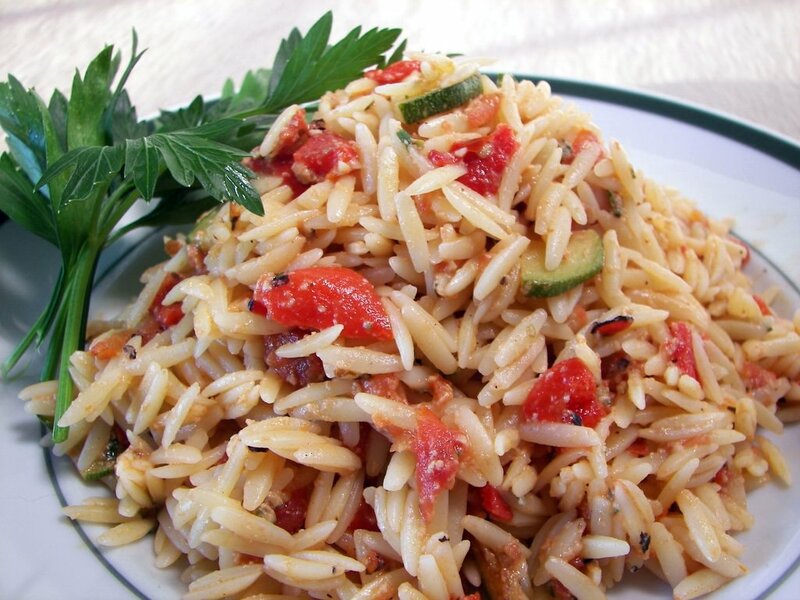 Stir in parsley, oregano, salt, pepper, tomatoes and bell peppers. Cook until heated through, about 5 minutes. 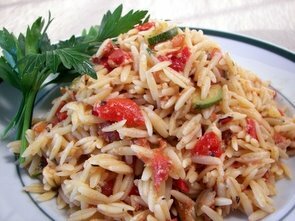 Remove from the stove and stir in cooked pasta and cheeses. Clean and pierce potatoes with a fork. Lightly coat potatoes with olive oil and sprinkle with coarse salt if desired. Place in the oven and bake until tender, about 45-60 minutes. Steam broccoli for 3-5 minutes, until crisp tender. Set in ice water to stop the cooking - drain and then chop finely. Carefully cut off the top third of the cooked potatoes. Gently scoop most of the insides out and place in a medium bowl. Set potato shells in a small baking dish. Add 1/2 cup cheese, sour cream, salt and pepper to the potato insides and mash with a fork. Mix in scallions and chopped broccoli. Evenly divide mixture between the potato shells and top with the remaining 1/2 cup cheese. Place back in the oven for 15-20 minutes until the cheese has melted and the insides are warm. In a large mixing bowl, beat butter and sugar together until light and fluffy. 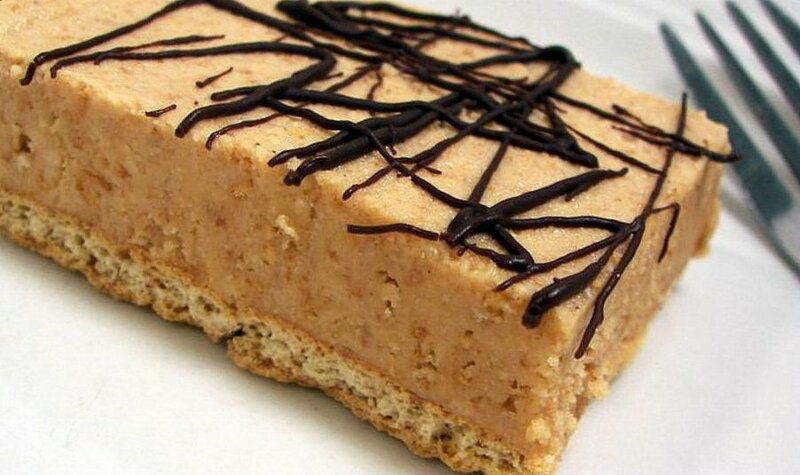 Mix in peanut butter until combined. Add in the egg and mix until well blended. In a medium bowl, whisk together flour, baking powder, and salt. Add to the creamed mixture and beat just until combined. Scoop mixture into a 9x13" baking dish and form a crust by pressing it on the bottom and slightly up the sides. Spread fluff over the base crust. Scatter peanuts over the marshmallow fluff and then add chocolate chips on top. Remove and place on a wire rack to cool completely. 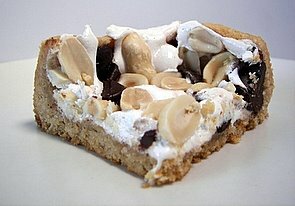 Cut into bars - I made 28 squares. Heat 2 teaspoons butter in a large skillet over medium-high heat. Add corn kernels. 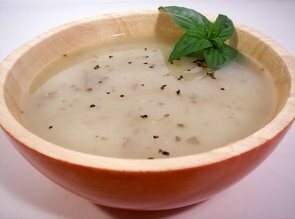 Cook, stirring often, for 3-5 minutes or until desired tenderness. Add 2 tablespoons butter, lime zest, lime juice, chipotle, adobo sauce, and salt to the pan - cook about 1 minute or until the butter melts. In a medium saucepan, bring water to a boil and season with salt. Add quinoa, reduce heat and simmer about 15 minutes or until liquid is absorbed. Remove from heat, cover and let cool. Roll small piles of the spinach leaves and thinly slice into strips. 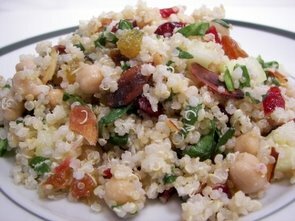 In a large bowl, mix together cooked quinoa, spinach, dried cherries, cucumber, chickpeas, almonds and red onion. In a small bowl, whisk together yogurt, oil, lemon juice and garlic. 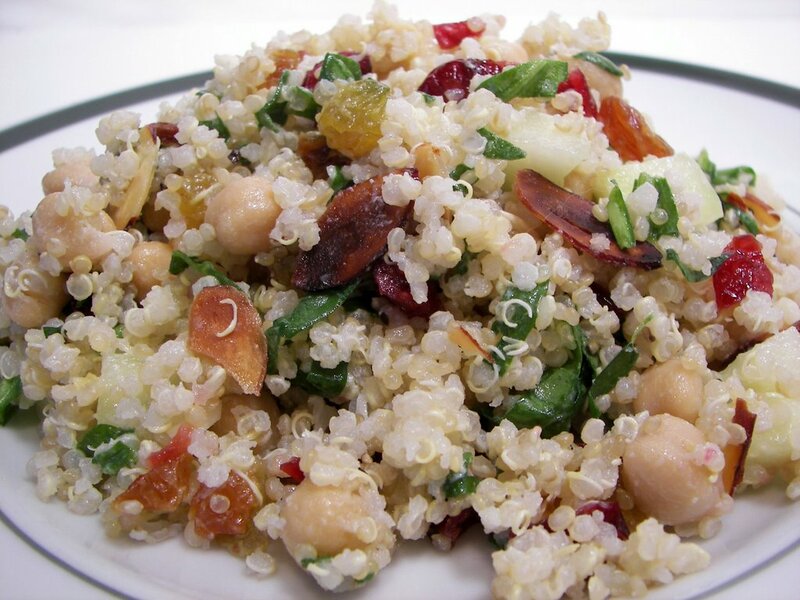 Pour into the large bowl with the quinoa salad and gently toss to coat. Taste and add enough salt and pepper to your liking - then cover and refrigerate for at least 30 minutes for the flavors to meld. In a medium bowl, whisk together flour, cheese, baking powder, oregano, basil, garlic and salt. Add in the cold cubed butter and mix in with a pastry blender until it resembles coarse crumbs. 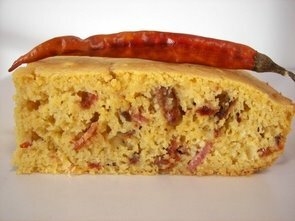 Mix in the crumbled bacon and enough of the milk until the dough is moist, stirring just until combined. Scoop dough onto a smooth surface dusted with flour. Roll dough to a 10" by 6" rectangle and cut into 10 strips. Separate sticks and place onto a parchment lined baking sheet, making sure to leave some room for them to expand. Gently brush sticks with milk and scatter with Parmesan. Place in the oven and bake 10-15 minutes, until golden. In a small saucepan, add rice and broth. Bring to a boil, reduce heat and cover. Simmer until the liquid has been absorbed, about 10-12 minutes. 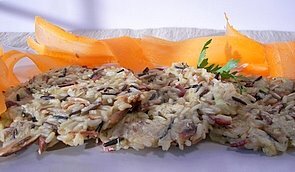 Scoop the rice onto a small baking sheet and let cool 5-10 minutes. In a large skillet, melt butter over medium heat. Pour in the eggs and gently cook just until set, stirring often to break them up. Remove and place in a small bowl. In the same pan, add canola oil and heat over medium-high. Add asparagus and cook for 2 minutes. Mix in roasted peppers, scallions, garlic and ginger. Cook until the vegetables are crisp tender, stirring often. Add in the cooked rice, soy sauce and vinegar. Cook 1-2 minutes, until the liquid has been absorbed. Gently fold in the eggs. Remove from the heat and stir in sesame oil and hot sauce is desired. Scatter coconut in an even layer on a large baking sheet. Place in the oven and toast until they are golden - making sure to stir often to keep from burning. This should take 2-6 minutes. Remove and let cool. In a large mixing bowl, mix together gelatin and 1/2 cup cold water. Let sit for 20-30 minutes to bloom. In a small saucepan, add granulated sugar, corn syrup, brown rice syrup, 1/2 cup water, and salt. Heat over low and gently stir just until the sugar dissolves. Using a wet brush, wipe down the sides to remove any sugar crystals. Increase the heat to high and cook, without stirring, until a candy thermometer reads at least 244 degrees. Remove from heat. Turn the mixer on low and slowly pour hot syrup in a steady stream into the gelatin. Slowly bring the mixter to high and let it go for 12-15 minutes - until very thick. Turn the mixer to low and add in the vanilla. Return to high and mix another minute to combine. Be careful when you do this as the mixture tends to expand quickly when the vanilla is added. Spray a 9x13" baking dish with cooking spray. Dust the entire pan with sifted confectioners' sugar. 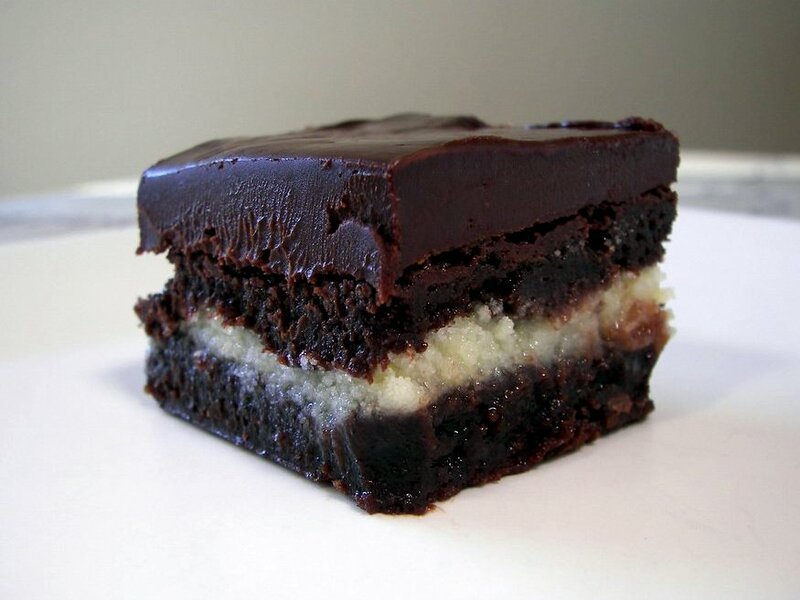 Line the bottom with an even layer of the toasted coconut. Scoop the thick marshmallow mixture into pan and spread to form an even layer. This is pretty sticky, so to help spread, add a little more sifted confectioners' sugar and pat it smooth with your fingers. Add a final light layer of confectioners' sugar and leave uncovered overnight to dry. Dust a working surface with confectioners' sugar and turn the marshmallows out. Using a bench scraper, or sharp knife, cut into squares. Dredge the cut sides into confectioners' sugar to keep them from sticking to your hands.